We are all very anxiously waiting for the outcome of our next president and the resolution of the financial crisis. OWA is currently refining our website with newer information on our members. Please take time to send us photographs of your work. We would be delighted to display them. We will use your photos to headline the various pages on the site to replace the old photos we currently use. We can also put a caption on the photo you send with a link to your own website if appropriate. Traditionally our OWA Holiday Benefit Party is a time of celebration with OWA members as well as a time of giving. We have been donating gifts to the Hamilton Family Center at 1631 Hays Street, SF for the past 10 years. The Hamilton Family Center is interested in clothing, books, paper and pens, toys and electronic gadgets for grown ups and children of all ages. Further information about this members-only event and a list of gift suggestions is available on our Holiday Benefit Party page. Sally Bould Stan (1917-2008) is no longer with us and this article is dedicated to her memory. When I first met Sally, she was in her early 80s and had decided to retire and close her architectural practice. Sally impressed me as a â€œpractical, down-to-earth (as Heather Reid described her in the September 1999 OWA newsletter) woman with a nice sense of humor. As a mother of three children, Sally had worked out of her home, with her drawing board placed on one end of the dining room table. This allowed her to effectively use every free minute when the family did not demand her attention, and not waste any time on commuting. When I visited her in 1998, Sally, with her low-key attitude, showed me her garage where she kept her drawings neatly stacked in big green garbage bags. I still have to chuckle when I remember this scene and my only regret is that I did not photograph it. Her legacy was 1,500 to 2,000 projects, mainly ranch houses, in the Lafayette area and Oakland hills in the East Bay. She designed them for a contractor or directly for clients, generally referred to her by word-of-mouth. Imagine, there were no paper files, just drawings, and Sally was able to date and organize her projects using her receipt book. She selected about seventy-five projects, which in her opinion would represent her career and sent them to the Archive. 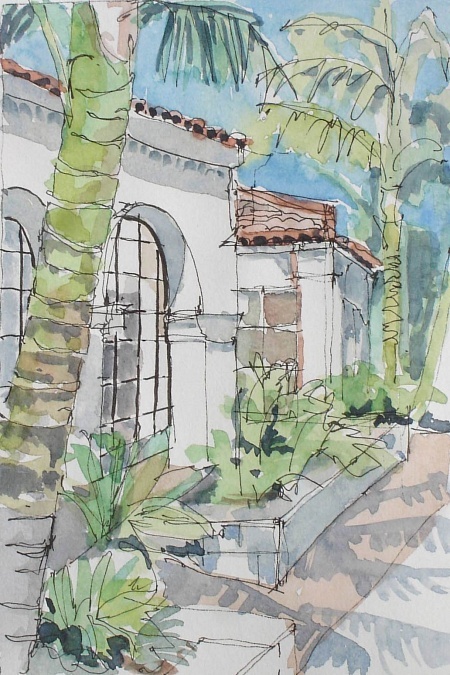 It was a meaningful experience at the end of her career to look back on her work and know that some of her drawings would live on at the IAWA. The second woman is Marie Laleyan AIA of San Francisco. As one of the early members of OWA, she is of importance to our history of establishing a women's organization with the goal of furthering women in architecture. When Marie closed her office in downtown San Francisco, due to health reasons, she began to organize her records and collect the drawings of her many projects. She is rarely mentioned in architectural magazines, because she is not a big star architect. However, her work in designing low-cost housing and renovating residential hotels in often run-down neighborhoods has had a profound effect on brightening the lives of many people. It restored dignity to their lives and allowed quality of life for people on the margin of our society. Marie's old friend from her native Bulgaria, Milka Bliznakov, the founder of the IAWA, had urged her for many years to send her collection to the IAWA. Now, with her fragile health condition, it was not an easy task. With an admirable persistence, she managed and assembled an impressive documentation of her career. In October of 2008, she sent her drawings, photographic records, and project files to the International Archive where her collection will be an important and valued addition. By the way, if any of you readers have the desire to preserve your own architectural heritage, you do not need to wait until you have retired or have reached the age of eighty. And, please, don't wait until you're too sick to select your work or, until, after your death, your children or executors wonder what to do with your drawings and throw them out because they do not know that they would be valuable to "Herstory"�, the history of women in architecture. You can do it now! Take some time out of your busy schedules and dedicate it to your legacy! Similarly to a down-payment, you can start by sending just a few of your favorite projects and add others over time, or you can send all your projects at once. For further information, please refer to the IAWA newsletter No. 19 of 2007 http://spec.lib.vt.edu/IAWA/news/news19.pdf at the bottom of the page 5 and read the article From Your Care to Ours which explains the donation process and which kind of projects the IAWA would like to receive. I will be happy to assist you with any additional questions you may have (415) 681-7594 or you can contact the Archivist, Dr. Aaron Purcell at adp@vt.edu or call (540) 231-9672. Our October General Meeting was a combined Steering Committee and business meeting to update our membership on what the Steering Committee members have been working on and more importantly to finalize our meetings and speakers for Calendar year 2009. We have over twenty people attended the meeting and the discussion was very lively and enthusiastic. 2. The requirement to act like a "Corporation"� which entails following the By-laws, having regular meetings, and officially electing members of the Steering Committee (SC) which will then act as the Board of Directors and the voting for SC members during the Holiday Party by sending out the slate of candidates 10 days in advance. 3. The requirement to purchase liability insurance. B. The group discussed the role of bank records - Mui confirmed that all bank accounts have at least two to three members' names. Suzanne disagreed on the suggestion of setting up new accounts with every new SC change. She said it is impractical. Traditionally, all OWA bank accounts and records are open for OWA members to view. Stacy requested and, all agreed, that the retreat bank account and records should also be available for all to see. The retreat account and the health plan account are also under more than one member's name on the signature card. On the issue of producing the annual financial statement as part of an annual report, Darlene volunteered to take on this task. C. We talked about present and future donations to the OWA and the need to provide letters to donors for tax purposes. D. The idea of producing an Operations Handbook that could ore closely define the role and responsibilities of SC . Leslie, Margaret and Caoline have agreed to take on this task. E. One clarification : the OWA general membership has approved in 1996 the paying of SC members to attend the Annual Retreat once during their service on the committee. 17 Feb: Presentation on real estate and architecture by Candace Wang: Mui to coordinate. 21 Apr: Presentation of Health Plan by Ann Jakemiec: Judith to coordinate. 16 Jun: Tour of Federal Building: Kathleen to coordinate. 18 Aug: Panel discussion: Stacy to coordinate. Sept: Annual Retreat in Westebeke. 20 Oct: Speaker on landscaping: Leslie to coordinate. A. The topic of the OWA's participation at the 2009 AIA convention being held in San Francisco was presented to retreat attendeeâ€™s and was met with enthusiasm. We talked about the possibility of a both which may or may not be possible. B.	Darlene suggested a reception to be held at City College that could be catered by the college. We could solicit our membership to submit their work and present it in an ongoing slide show. We could have OWA business cards produced and an updated handout and group picture. We might also have special exhibits such as Inge Horton's historical work on women architects. A. The Holiday party will be held at Darlene's office, Barcelona Jang at 351 Bay Street, 3rd Floor, San Francisco on December 7th at 4 pm. Several parking options are available which will be announced to the membership. B. Judith suggested that the OWA apply to the AIA to become an AIA/CES provider in order to provide the benefit of LU's (Learning Units) to the membership for our various lectures and tours. However, maintaining the paperwork necessary for this may be too labor intensive for SC. Discussion on keeping the SC to a small number of five, which is a more workable number and proved to be very efficient in the past. Judith, Larissa, Margaret and Suzanne will go off the SC this December and Caroline will go off mid 2009. Carolyn Orizi has agreed to come on board January 2009 and Mary Anne Perkowski mid 2009. Margaret stays on as our Archivist. It was a beautiful day in Sonoma at the OWA Retreat. 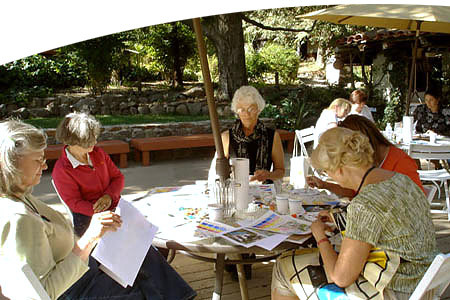 Judy Rowe gave us a short lecture, a few exercises and then set us out to enjoy for ourselves and to have fun with watercolor journaling. She emphasized the importance of not spending too much time on either the ink drawing or on the watercolor application. 1. It looks easy, but it's not! Don't get discouraged. The professional watercolorist does not get it right all of the time. 2. If you mix on the palette, mix more paint than you need; It's best to mix colors on the paper and let the water "mix the colors"�. Remember that you need less paint from darker colors when mixing with lighter colors. 3. Preserve the "white"� of the paper. Paint around white shapes. This is what gives watercolor its distinctive appearance. 4. Using "suggestion"� in your drawing and painting is much more powerful than being explicit about every detail. The outside of the shape you draw/paint will tell the viewer what the object is. 5. Keep a sketchbook / journal with you always! and use it. Your travel journal will develop your "eye"� and the way you see things. Practice, practice, practice and then practice some more. 6. Composition is best when you remember the "three bears"� (papa, momma and baby bear). Have an odd number of objects and very the sizes in your composition. 7. Keep your watercolor painting out of the sun. 8. All drawing/painting is about the relationships of angles & shapes. The more drawing & painting you do the more you will learn to see the "negative"� spaces/shapes between objects. This will allow you to get the "relationships" between objects correct. 9. Use as big a brush as possible. Big brushes help you paint looser. 10. Have fun with your watercolor travel journal and enjoy the journey! "Building Houses, Not Keeping Them"